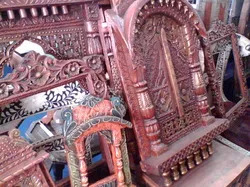 Established in the year 1988, Surya Handicrafts, are a reputed manufacturer, supplier, trader and exporter of Handicraft Items. All our products are crafted with utmost precision and perfection owing to which these display elegance, optimum creativity and excellent work of craftsmanship. The attractive appearance and enthralling designs of our products make widely used in various hotels, offices, homes and other establishments for enhancing the overall looks of the interior. Our offered products are extensively used by the customers for gifting purposes to near and dear ones. A state-of-the-art infrastructure is developed by us for having streamlined production as well as post-production of offered range. 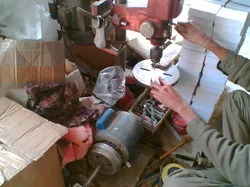 The infrastructure of our firm is armed with all the requisite technology and resources that are required by the craftsmen and other experts for completing their assigned tasks with perfection. Further, all the finished products are kept by us in a secure manner at the spacious warehousing unit. Linked with major transportation network, our warehousing unit supports the logistic team in providing scheduled delivery of orders at the patrons' destination. All our experts implement their innovative skills and knowledge to bring forth a commendable array for clients. Due to all these attributes, we have gained the trust of numerous patrons, based in different nooks and corners of U.K., Italy, South Africa, Sultanate of Oman, France, Switzerland, Germany and many other nations & continents. All of our operations are headed by our manager, 'Mr. Sunil Kumar Saini', who has played a remarkable role in the tremendous growth and success of the firm. His ethical business policies, detailed industry knowledge, fascinating trade decisions and proficient managerial skills have helped us acquire a widespread clients-base in domestic as well as international market. We are majorly looking for International Queries. 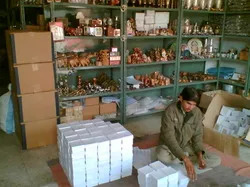 We are a reputed enterprise, engaged in manufacturing, supplying and exporting a plethora of Handicraft Items. The range offered by us encompasses Blue Pottery Items, Lac Items, Marble Items, Wooden Handicraft, Wooden Jewelery Box and Pen Stand. 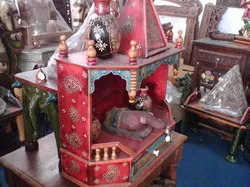 In addition to these, we offer Meenakari Items, Hanging Chimes, White Metal Items, Handmade Sculpture and Camping & Sporting Instruments, to name a few. All our products are crafted using completely eco-friendly material in a perfect blend of traditional and western design. Designed for optimum perfection, these products are carefully crafted in tandem with the specifications detailed by the valuable patrons. Further, patrons can avail our entire array in different standard sizes, designs and colors as well as in customized forms in sync with their preferences. In order to offer our esteemed clients with quality products, we have built alliances with a vast and authentic vendor base. Our vendors are known to use quality ingredients and processing techniques while developing the range. We choose our vendors on the basis of their market position and credibility. Some other reasons that we keep in mind while selecting our vendors include their domain expertise, timely delivery, financial stability and packaging standards. Due to this highly renowned vendor base, we are able to cater to the diverse requirements of customers within the stipulated time-frame. Over the years, we have been able to carve a sophisticated niche of success in the market due to the tremendous support provided by our experts. The professionals working with us implement their skills and expertise to design and craft our offered Handicraft Items in sync with the prevailing market trends. Our production team makes optimum use of available resources to bring forth a cost-effective as well as eye-catching assortment of products. Moreover, understanding the benefits of team-work, all our professionals strive to attain the organizational targets by working in close proximity with one another.